Background: Design against fatigue failure is very significant because a lot of failures in engineering applications occur due to fatigue. Notches and holes are available almost in all engineering applications. Crack initiation has a vital role in fatigue design because once crack initiates it is very difficult to stop. This work is related with design against fatigue failure considering notch at the specimen. Methods: The experimental study shows the initiation of crack caused during fatigue of casting alloys. It explains the crack initiation and fatigue strength of Aluminium alloy mineralized with silicon. By using both mechanical and thermal loading; crack initiation at notch root as well as fatigue life have been computed by means of single and two step loading. 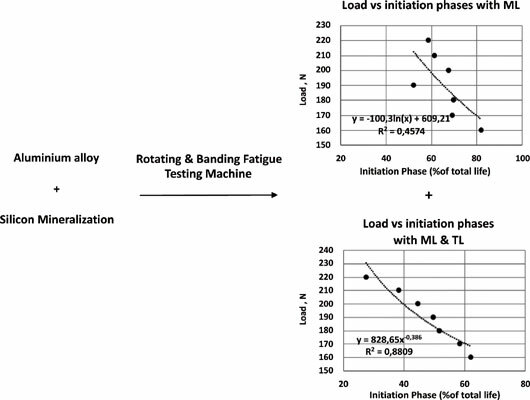 Phase life initiation has been reported by applying load sequence effect using four-point rotating and bending fatigue testing machine. A favourable working temperature and environment have been set up for the alloy used and experiments have been performed on rotating and bending fatigue testing machine. Results: The results from the experiments have been plotted in the form of S-N curves and comparison has been conducted between crack initiation to failure at several mechanical loadings with and without thermal loading. Conclusion: It has been concluded that mineralization affects during the case of both mechanical and thermal loading. Logarithmic and power behaviour of material are obtained during two different cases. Mathematical model for experimental data is also reported. Keywords: Fatigue, initiation, mineral, silicon, SN curve, crack initiation. Keywords:Fatigue, initiation, mineral, silicon, SN curve, crack initiation. Abstract:Background: Design against fatigue failure is very significant because a lot of failures in engineering applications occur due to fatigue. Notches and holes are available almost in all engineering applications. Crack initiation has a vital role in fatigue design because once crack initiates it is very difficult to stop. This work is related with design against fatigue failure considering notch at the specimen.